In today's issue of Waiting for Wednesday, I'd like to talk about spoilers. And how much I hate them. And how stupid they are. And how much I like them. And how important they are. Yep. It's gonna be one of those days on Exfanding. So, take your protein pills and put your helmets on. Now, clearly, we live in a comic book world that's vastly different from any other that's come before it. It's a world of up-to-the-minute Internet news sites and up-to-the-second writer's Twitter feeds. Unlike older generations of comics fans, today we know who's drawing what, and which editor dislikes working with which writer, and for lack of a better saying, the curtain has been pulled away, dropped to the ground, lit on fire, and we've seen the wizard (and the Wizard, for that matter). And there's very little that's left unknown when it comes to our favorite books and series and crossovers and creators. Even more than that, though, is the fact that it's a comic book world in which we know what's going to ship from which publisher months in advance. Diamond's Previews catalog is a necessary evil in the comic book business, and because retailers and customers have to order their books through Diamond, it's important for publishers to show their hands early, if you will. What I mean is, if there's a big, honking story point that's going to take place in an issue of Spider-Man in, say, May, we'll all know about it the first week of February, when Previews comes out. And that's something that I understand, and it's something that at least allows the reader the option of not buying Previews. Because stories are solicited months ahead of the street date for a book, retailers generally know what book they'll need to order more of. Of course, there are exceptions to the rule--like with the Obama Spider-Man variant, or the Death of Captain America issue. In both cases, retailers only knew "something big" was going to happen, and that they might want to consider bumping up their orders. Comics retailers, though, are a cynical and intelligent lot, and most have long memories. So, many took both instances as another case of publisher hype. You know, "been there, done that, no thanks." Those stores that learned from history and didn't buy into the hype machine were left with many fewer copies than there was demand for the copies. Or, as in the case of my LCS, they had none of the Obama Spidey variants, and the Cap's Dead issue sold out, completely, before lunch. But, for the most part, retailers have a good idea of when "something big" is actually Something Big, and usually the readers do, too. 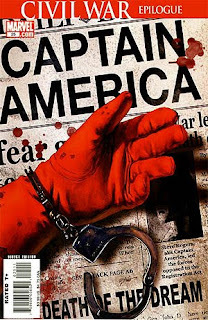 And, while it would have been way more shocking had I read about Cap's demise in the pages of his comic as opposed to the New York Times, Newsarama, and CBR earlier that morning before any shops opened, I most likely would have missed out on actually picking up the issue had the plot not been spoiled. That Wednesday, I hit the LCS much earlier than usual, knowing full well that there would be a metric ton of both comics curious civilians and speculators looking to cash in on the historic nature of the issue. Because I got to the store so early, I was able to snag the very last copy of the book. If Marvel hadn't leaked the contents of the issue beforehand, I wouldn't have been able to procure a copy for quite a while, and I would have missed out on one of the great modern comic book issues. Spoilers, bad. Unless spoilers good, of course. Spoilers are part of the game, and they'll always be a thing in comics. So, fine, I can live with it when a story leaks to Bleeding Cool, or we find out about a return of a major character in Previews. What I can't live with is when a book is spoiled by the publisher, in one of their own titles. Let's take Captain America: Reborn, for example. In this case, the spin-off series (Captain America: Who Will Wield the Shield?) began before the series it spun off from ended. And what did Marvel do? Well, they printed an apology in the front matter of Shield, acknowledging their screw up, and promising that the final issue of Reborn would be out as soon as possible. I can hear you asking, why didn't they just hold off on Shield until after the final issue of Reborn hit stands? Good question. And I'm not sure, really. But that's okay, because Cap's return had already been spoiled in the latest issue of Hulk, written by Jeph Loeb. I read that issue of Hulk before I got to the backlog of Reborn issues sitting on my pile, so it took me a while to figure out who the blond haired guy everybody kept calling, "Steve," actually was. Now, that example is bad enough. But Dark Horse trumped Marvel's play, by a lot, in my opinion. They one-upped the stupid, if you will. For months--actually, over a year--Joss Whedon's Buffy series and its heroes have been plagued by a villain named Twilight. We were never privy to who this new big bad was, but it was a major story point with the reveal of Twilight's identity hinted at and teased countless times by the writers. So, finally, we get to this latest arc--mere issues before Twilight's identity will finally be revealed, which will be the moment in this new Buffy series, right? Right. Well, Sunday morning I just happen to be trolling the Internets while I'm waiting for the start of the early NFL playoff game. I hit Newsarama, and guess what the headline is? Yep. The reveal of who Twilight is. Now, since I'm not entirely heartless, I won't re-spoil it here. It's all over the bloody Internet, so I'm sure either you already know, or you've somehow managed to avoid it being spoiled. If that's the case...you deserve a medal. Unlike the situation with the Death of Cap, this whole Twilight thing really annoyed me. Whedon's been building and building and building, all up to this moment. This reveal will be THE defining moment of the first comics "season" of Buffy. So what does Dark Horse do? They give it away for free, in an online interview. As others have pointed out, the title has seen a dip in readership over the past year. Personally, I think it's because most Buffy fans are reading the book in trade. Still, Dark Horse was obviously spooked by this, and, capitalizing on their impending reveal, they leak the identity a week before the book ships, hoping to get people excited about buying the single issues again. Y'know what would have been really exciting? Having the identity revealed while reading the book. And Newsarama did nothing to warn readers of the imminent spoiler, so I just opened their page and POP there it was. And why should they have warned us? Dark Horse flat out told them, so the publisher obviously wanted the news plastered online. Frustration, thy name is spoiler. Now that that's out of my system (I hope), let's get to some new releases, shall we? It's a moderately-sized week of new books, but there's some really good stuff out there. I'll start with Buffy, since it feels like the right thing to do after my tirade. I love Dark Horse, and by and large, theirs are the books I most gravitate to. 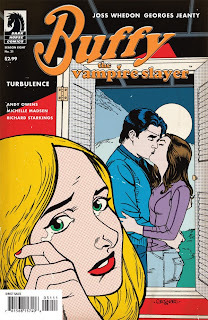 Buffy Season 8 has been one of the best books the publisher has produced over the past couple of years, and since we now know some of the future plans for the book, it seems like it'll remain strong and fun and a good read. After Willow unearths giant Tibetan goddesses to help in the fight against Twilight and his disposable soldiers, the Slayers are forced to retreat when the goddesses go AWOL and attack indiscriminately. Without powers the Slayers are unable to keep up the fight against missile fire, grenade launchers, and tanks. It would seem that all is lost, and Buffy -- all alone -- must make her last stand on a battlefield covered in the bodies of friends and foes. 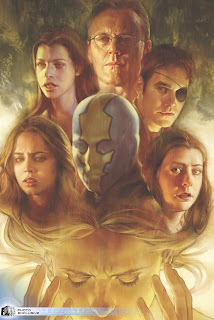 Series artist Georges Jeanty reunites with Buffy creator Joss Whedon for this very special Season Eight one-shot. Next up, we have an interesting Batman book from DC and writer/director Kevin Smith. Following up his critically acclaimed Batman: Cacophony mini-series, Smith re-teams with friend and artist Walt Flanagan on Batman: Widening Gyre. I got around to reading the first three issues of this series a couple of weekends ago, and it hooked me. Issue four hits stands today, and I really think this book has appeal for Batman fans, new and old. It's a good book with great writing, and Flanagan's art gets better with each issue. 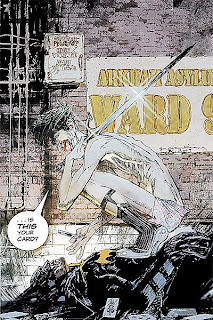 For fans that might not have dug Batman's (and Joker's, for that matter) out of character dialogue in Smith's first Batman series, I think Gyre has more there for the longtime fan. It feels like a new take on an old Batman story, which is really high praise in the world of comics. For Smith fans, it's must-read, so check out the first issue--it should still be available at your comics shop. If you like it, keep in mind that DC is collecting the story in parts, and the first six issues will make up the first trade. 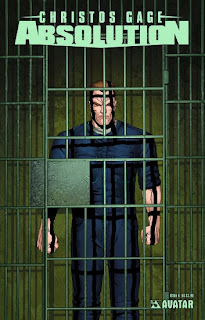 Finally, we have the conclusion of Avatar's six issue mini-series, Absolution, written by rising star Christos Gage. Since this is the last issue, I'd suggest waiting on the trade at this point, but I give this book a lot of credit. And I wish more people picked it up as single issues. It's just a solid, post modern super team story, and I think Gage did a great job. It all comes to a head in this explosive final issue! The house of cards has collapsed. The web of lies has unraveled. With his life falling apart around him, can John Dusk survive? Or will he who chases monsters become a monster himself? Don't miss the shocking conclusion of the acclaimed miniseries - the book Ed Brubaker calls "my favorite thing from Christos Gage so far"! John always knew there would come a time when he had to choose between his two lives. That time is now. And either way, there's no going back. He wants to be forgiven...but he doesn't want to stop. If you like your heroes in the vein of The Authority or The Boys, then this book is a must-read. I'd go on, but honestly, I'm beat. Sorry for the ranty-ness of this thing, but I have comics on the brain lately. All that's left to do is to ask: what are you Waiting for?